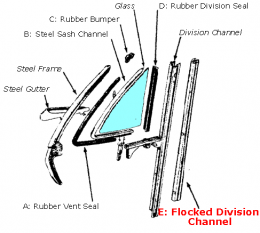 Flocked division channel - two 4' long strips, rigid. Steel channel with flocked lining as original. These seals go on the back side of the front door vent window frame to accept the door glass. MADE IN THE USA.